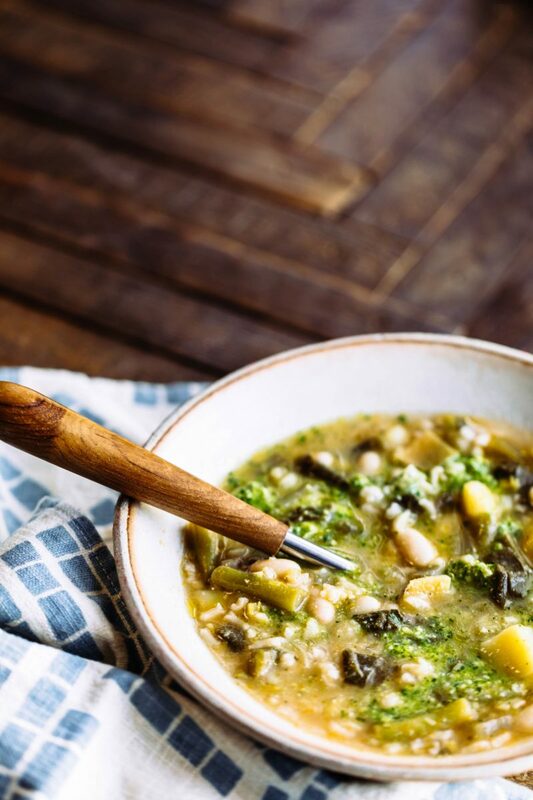 This gluten-free green bean and white bean soup au pistou is the minestrone of southern France: light, bright, green, and white. The optional Parmesan rind adds body to the broth and a bit of saltiness. Adding parsley to the pistou (pesto) echoes the fresh green flavors of spring; in summer, you can be make it with basil only. For a dairy-free version, skip the Parmesan rind and the pistou and serve with a lemon wedge for extra tang. Trim the center stems from the chard leaves, then dice the stems. Set the leaves aside. In a soup pot over medium-high heat, warm the olive oil, then add the chard stems, celery, and leek. Cook, stirring often, until the vegetables soften, about 5 minutes. Stir in the garlic and rosemary and cook for 30 seconds. Add the broth and Parmesan rind. Cover the pot and bring to a boil. Add the potatoes and rice, reduce the heat, cover, and simmer for 10 minutes. Meanwhile, cut the chard leaves crosswise into thin strips. Add the green beans, chard leaves, and cannellini beans to the soup. Bring to a boil, reduce the heat, cover, and simmer until the vegetables are cooked through but haven’t lost their color, about 10 minutes longer. While the soup is cooking, prepare the optional pistou. When the soup is done, remove the lid and let the soup stand off the heat for 10 minutes to settle the flavors. To serve, season with salt to taste, ladle into bowls, and swirl a spoonful of pistou into each portion. MAKES ABOUT 1/2 CUP This bright nut-free pesto adds verve to soup, eggs, or fresh sliced mozzarella and tomatoes drizzled with olive oil. Store airtight in the fridge for up to 3 days. In a food processor with the motor running, drop the garlic through the feed tube. Remove the lid, add the parsley, basil and cheese, pulse until finely chopped, then scrape down sides. With the motor running, pour in the olive oil until blended. Transfer to a bowl and set aside until ready to use.